For this November edition of Top eBay Chess Items by Price (March 2010), my first choice would have been a painting titled 'Charles Schreiber, 1845-1903 French, "A Game of Chess" Oil'. Then I realized that it was exactly the same item that I featured three months ago in Chess with Two Cardinals (August 2018) -- same title, same description. This time the painting sold for US $1500 after one bid. Instead of the cardinals for a second time, I picked the painting shown below. Titled 'A Game of Chess Antique Genre Oil Painting Josef Morgan (Austrian, 1839–1898)', subtitled 'Attributed to Morgan - Signed with Initials - Inscribed', it sold for GBP 620.00 ('approximately US $803.71', according to eBay) after receiving 37 bids from 14 bidders. 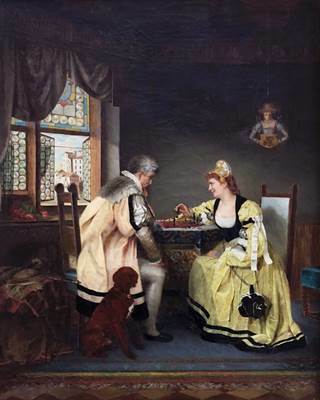 A very fine 19th century genre painting depicting an elegantly dressed couple playing chess in an interior which is presumably the work of Austrian artist Josef Morgan (Austrian, 1839–1898). The frame (not shown here) carried a small plaque, 'J. Morgan 1894'. Another variant of the name is Jozef Belohlawek Morgan. Whatever the artist's real identity might be, we have another reminder that Chess Paintings Require Dogs (April 2011).